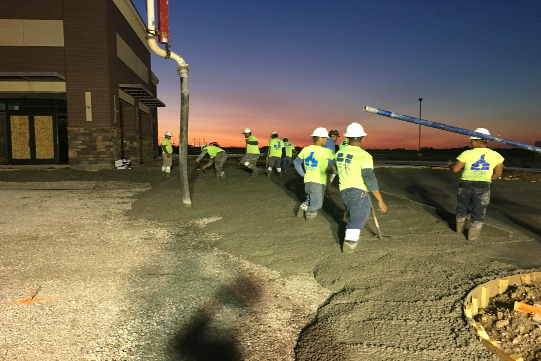 Bedrock Concrete offers a full range of concrete construction solutions for commercial, retail, city or state government and multi-family projects. We created many of the foundations, concrete buildings, parking lots and walkways around the KC metro. Bedrock Concrete LLC was established in 2013 with the purchase of Beran Concrete Services. Our team has decades of experience in concrete construction solutions and buildings. Our home office is in Olathe, Kansas but we service the entire Kansas City Metro area including all of Johnson and Wyandotte County in Kansas, and all of Jackson, Clay, Platte and Cass County in Missouri. We pride ourselves on our quality and dedication to get the job done right. We are devoted to leading-edge concrete construction practices. Quality craftmanship and customer service are our top priorities.